I'm totally angry and holding the biggest grudge against....the weather. Hi. It's October. NOT ONLY THAT, but it's well into the Fall season. Not just a day or two into Fall, but like...a few weeks. So weather...what's up? Why is it SO hot here?!?! Now, I have to say I feel a little discriminated against. You see, my friends on the OTHER side of the country are posting pictures of themselves in sweaters with cute boots on, nifty scarves...walking along mustard yellow and brown leaf covered streets. They're all drinking hot drinks and saying things like "Fall is totally here! I'm going to bake cookies and light my fire place tonight. I'm going to snuggle up with loved ones!" <-- May be exaggerating a little. Anyway, my point is this: I can't even imagine touching a sweater let alone wearing one! BOOTS?! I'm lucky if I feel "cool" enough to wear sandals....or even get up and put any clothes on for that matter. As it stands, I'm way too busy sweating my days away on the couch with our biggest fan right on me. Someone please tell me the "wind blown look" is in. No need for a fireplace here, it feels like we're standing/sitting/eating/sleeping/breathing fire all day every day. Lastly, my husband and I have been eating salads every single night because I can't stand to even look at my oven. It feels good to "cook" from my ever cool fridge. And honestly...salads are good...but not as THE ONLY MEAL...every single night. Poor guy. So weather...what's up with that?! Yeah yeah, I know- I was alllllllll about the warmer weather once upon a time. But 4 months later...258979346 heat waves later...I'm done. It's Fall. Bring the cooler breeze will ya? I bought yellow tights at Target for $5 and I want to wear them. Not only that Mr. Big Shot Weather Man (Woman?) 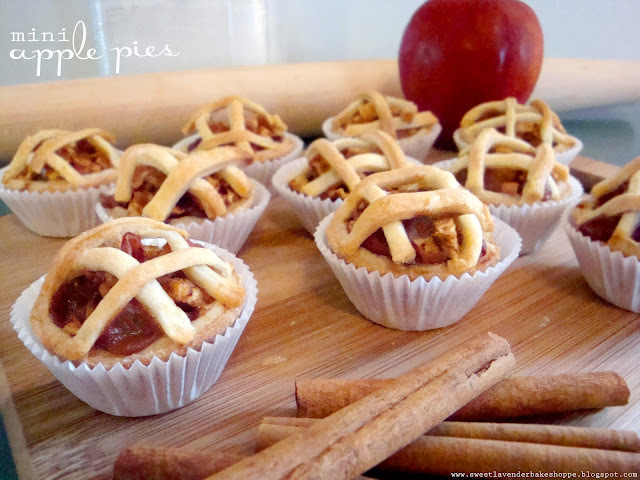 but I have about 389 Autumnal/Apple-y/Pumpkin-filled/ BAKED things I want to make! Desserts are a callin'! Apples are all around me in their apple-y glory and my local Trader Joe's JUST packed their store full of the most beautiful sugar (pie) pumpkins to date! I want to bake, weather. I want to stand in my warm kitchen in my yellow tights and bake an apple-cranberry-pumpkin-cheesecake-pie-casserole-spiced latte NOW! I want to make some more of these little bite sized babies. I'm totally craving the flavors of warm vanilla and cinnamon. I'm needing to add ground cloves and nutmeg to something and these cuties are begging for some. Perfect for a party, Thanksgiving, get-together, or heck...to snack on while snuggled up by the fire watching a movie with the man you love. 3. Turn your mixer down to low and SLOWLY add your ice water (omitting ice!!) little by little until the dough JUST comes together and starts to pull away from the bowl (DO NOT OVERMIX WHAT SO EVER). I said "ish" in the ingredient list because depending on where you live and the weather the day you do this, your water amount will change. Just add a little at a time until you achieve desired look. As soon as it does this, STOP mixing! You can easily over mix- which will result in a less flaky crust. For an in depth look click here. 5. When the dough has chilled, pull out of fridge and roll out on a floured surface until you have a circle about 1/8"-1/4" thick. Using a 2.5” circle cutter, cut out 24 circles. Take your mini muffin or cupcake pan and push circles of dough down into tins using end of dowel (or your fingers). Do NOT line the pan with liners. You do not need to grease pan either. I added little mini liners after the pies had baked and cooled for a fancy effect. If you're nervous, you can very lightly grease...but make sure it's light :) Make sure to really press dough down into the bottom of tins! This will make a flat bottom and allow the pies to sit on a counter or platter by themselves. 6. Once all circles of dough are in the tins, set in fridge to chill while you prepare the filling. 2. In a bowl mix together tiny squares of apples, vanilla sugar, brandy, vanilla extract, lemon zest, cinnamon, allspice, cloves, nutmeg, and salt. 3. Spoon about 2 teaspoons of filling into cups (or until filling reaches top of dough) and top with tiny dollop of unsalted butter. **Optional** Left over dough? Make little lattices! Or you can always do this. Totally yummy with no crust on the top, as well! Or you could even make some crumb topping and top with that instead! 4. Place cupcake tin on a baking sheet and place in oven. Bake 350*F for approximately 12-15 min. Check after about 10 minutes. You're looking for a crispy golden brown crust and bubbling filling. 5. Remove from oven and allow to cool about 10-15 minutes. ** Can store in an air tight container in fridge for up to one week. When wanting to serve just allow to come to room temp. ** Can freeze in an air tight container for up to a month. ** Can store in an air tight container room temperature for 2 days. Now for some real talk. My heart has been kind of heavy this last week or so. Know what I mean by that? Certain circumstances in life just weigh you down so much that you're to the point of mental, emotional, physical AND spiritual exhaustion. I'm just a big ball of exhausted messes right now. I've been trying my hardest to remember to breathe and to make sure I relax- crying and calling out to Jesus every single day- if not multiple times a day. Blarg. It's just a harder time, you know? Thank goodness I'm an over-doer and had some blogs lined up ready to post! All I had to do was add a little opener (or nothing at all) and viola- post done! What a blessing that has been these last two weeks. Healing for an old friend of mine who just found out a couple of weeks ago she has leukemia. She's only a year older than me, has 3 kids, and a loving hubbie. We're all pray pray praying the chemo she's about to finish will do it's healing job. Praying for that cancer to be wiped away! Healing for our two cats who have been battling some pretty nasty infections for the last two weeks as well. Mombi was first, she lost A LOT of weight, and then she passed it on to Mustachio. Poor little Mustachio is taking it pretty hard and I've been up for the last 3 nights helping her get through the long night. AKA- I'M SO TIRED! Hahaha. So prayer for healing in their little bodies as well. Prayer that Mustachio will take her medicine (pills for cats is the WORST idea ever) and continue to get better by the day...oh and that I'll get some rest! Finally, prayer for me as I have a little weird pain in the right side of my stomach. Could be nothing...but going to get it checked on the 20th- prayer for healing if it is something...and for strength and courage should it result in another surgery. <-- REALLY hoping that isn't the case. Thank you so much friends! I appreciate the fact that I can be honest and real about life's "not so fun" things, from time to time. I so very much appreciate the prayer circle I have across the country- THANK YOU. Christina-I will keep you in my prayers. I have been praying for you this week. It's amazing how many friends right now I have going through trying circumstances. The wonderful promise we cling on to is Romans 8:28...It is often in the trying times that he strengthens our character and draws us closer to Him. THANK YOU Melissa!! Your prayers are SO incredibly appreciated. Prayer is one of the most powerful things we can do for each other! Especially when distance separates some friendships ;) You know- our kitty is doing better today, finally. There's some actual improvement being noticed finally! So praise Jesus for that. He's so faithful!! You're so right about the trying times- 2 Corinthians 12:9-11 “My grace is sufficient for you, for my power is made perfect in weakness.” Therefore I will boast all the more gladly about my weaknesses, so that Christ’s power may rest on me. That is why, for Christ’s sake, I delight in weaknesses, in insults, in hardships, in persecutions, in difficulties. For when I am weak, then I am strong." Amen right!? It's because of the trying times that my faith even exists. Because of the storms that I truly felt and saw His protection and love. I have testimonies that I can use to help and share with others because of the painful times. In my weakness He has made me strong! You ABSOLUTELY can use pre made/store bought pie crust!! Hope it makes your first pie making experience fun!